Perceptual Reality have partnered with Engagement Multiplier to support you in developing a powerfully engaged organisation. Employee engagement can be defined as a workplace approach designed to ensure that employees are committed to their organisation�s goals and values, motivated to contribute to organisational success, and are able at the same time to enhance their own sense of well-being (source: Engaging for Success, MacLeod and Clarke, BIS). How engaged is your organisation? Do you really know what�s going on in your organisation? As a leader or business owner, you face dozens of decisions every day. As you grow commercially, these decisions become more complicated and have more serious ramifications. The most successful entrepreneurs and business leaders will tell you they have made many wrong business decisions along the way, most of which could have been avoided if they had the right information at the right time. 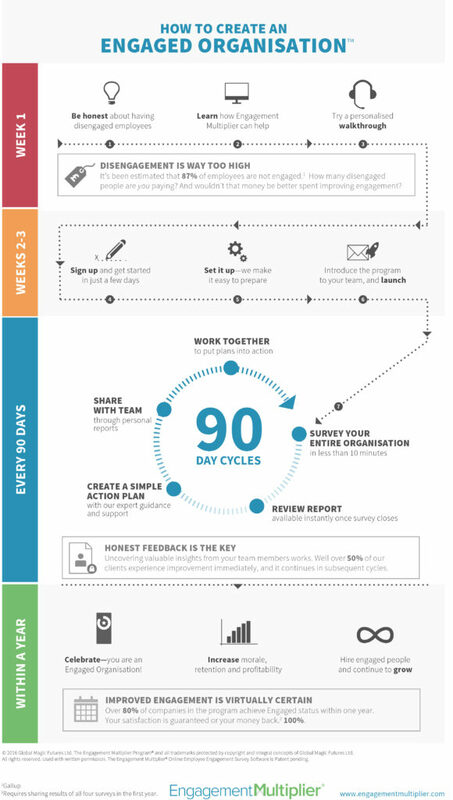 Engagement Multiplier is a web based employee engagement platform which helps you to measurably transform your organisation through quarterly assessments, secure two way feedback and 24/7 suggestion box. Using this innovative digital platform, you are able to accurately measure employee engagement levels and find out what�s really going on every 90 days. The platform then takes this data and automatically converts it into actionable insights, from which you can take immediate steps that deliver measurable results. What�s more, the program is simple to implement, isn�t labour intensive or disruptive to your business � and runs seamlessly in the background. Perceptual Reality can provide a range of services and solutions to complement your interaction with Engagement Multiplier, including utilisation of one of the most detailed and comprehensive cultural diagnostics and values assessment instruments commercially available; the Cultural Transformation Tools (CTT). Our high-impact coaching, counselling, human potential and consultancy supports you in achieving sustainable change, transformation and development. From leadership and team development through to values alignment and improved communication, we will help you to distinguish perception from reality. If you�d like to find out more, simply get in touch via the link below, and we�ll personally arrange a demonstration with Engagement Multiplier as well as allow you to be eligible for a free engagement report for your organisation.